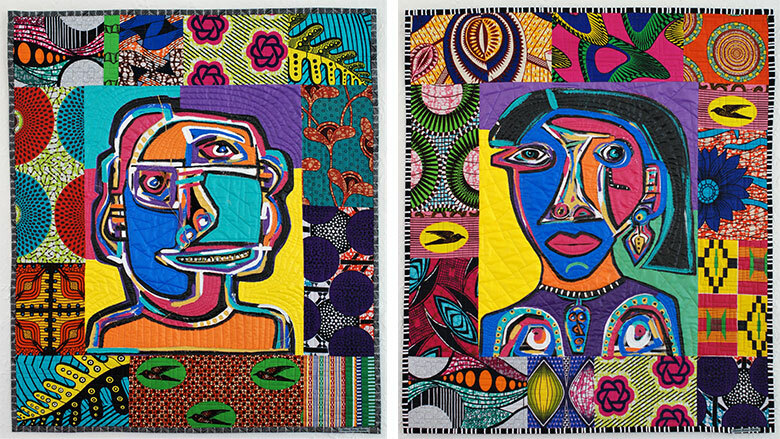 Sharon Kerry-Harlan's quilts and collages combine dense patterns into complex rhythms, creating images that hum with energy. While she has most often favored a quiet palette of rich browns, ochre, and black, Kerry-Harlan recently began working in vivid color, incorporating African print fabrics and bright acrylic paint. Her solo exhibition will combine these new works with a selection of her exceptional discharge-dyed quilts and small, mixed-media collages that tend toward abstraction. Kerry-Harlan's rich patterns often center on the human figure, especially the face. In her words, "The density of contemporary city living provides inspiration for my work. My art, like a bustling city, merges vocal, electronic, mental, and spiritual chaos into a confluence of concentric hustles, jabbers of conversations. The mass of human faces in the crowded urban environment intrigues me—what they reveal to the world and what they disguise from the world. In my artwork, I use the human face and figure to make statements about the quick turnarounds that confront us both in life’s mundane and unexpected circumstances." Raised in Hollywood, Florida, as a child Sharon Kerry-Harlan was surrounded by art deco architecture, streamlined furniture, and mid-century modern patterns that piqued her sensibilities to design.